In Ant-Man and The Wasp, we catch up with Earth’s tiniest heroes. Scott Lang (Paul Rudd) is so close to completing his house arrest sentence when Hope van Dyne (Evangeline Lilly) and Dr. Hank Pym (Michael Douglas) show up to enlist his help after making a breakthrough in finding Janet van Dyne (Michelle Pfeiffer). Since he owes them for blowing their tech’s cover at the airport in Germany to help Cap, he once again dons the suit but this time joins Hope as she finally steps into the role of The Wasp. Hot on their trail, a mysterious figure named Ghost (Hannah John-Kamen) is on the hunt for the tech and Pym finds himself seeking help from his old partner Bill Foster (Laurence Fishburne). 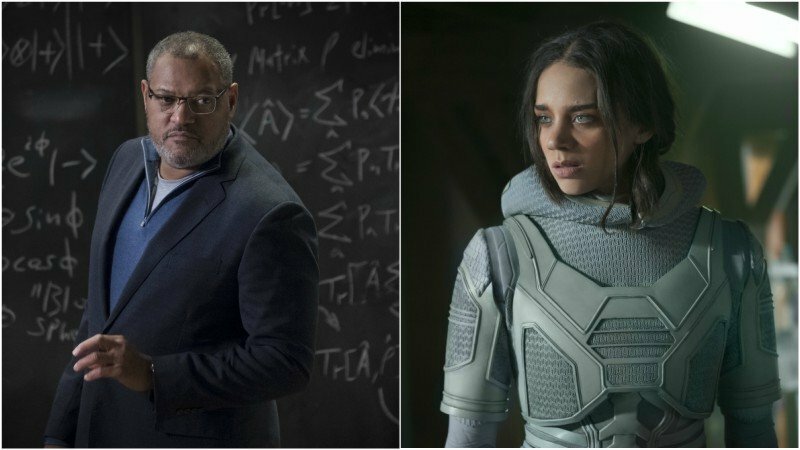 At the press day for the film, we talked to Laurence Fishburne and Hannah John-Kamen about the film, their surprising allyship in the film and being a part of the Marvel Cinematic Universe. Warning: Potential spoilers ahead! Read on only if you’ve seen the movie! ComingSoon: Being apart of the Marvel Cinematic Universe is such a big thing. What excited you about coming into this world? Hannah John-Kamen: I’m such a fan of Marvel. I’m such a fan of the first Ant-Man, to be invited to be part of the universe? It’s very overwhelming for me. And I’m honored. It’s daunting. You have this responsibility to take this character, who was originally a male character in the comic books, and give her life. I was up for the challenge. Laurence Fishburne: I have been a big comic book reader and collector since I was a pre-teenager. I grew up in New York in the 70’s reading Marvel and DC comic books. So to be in either world is a dream come true to me. Doesn’t even matter what part. It’s fun to play a guy like Foster, who’s like a scientist, who has all this kind of knowledge. It was great to bounce all that off Michael Douglas because our characters have a history and things didn’t sort of really end well. It as great to play that and then the nurturing aspect of his relationship with Ava, playing that kind of protective paternal figure was also really nice. CS: The relationship between Ghost and Bill Foster is revealed to be vital in this film about family relationships. Can you talk about working on the backstory for that? LF: It was really on the page. That whole story about what happens to her as a child. Bill comes into her life and all that stuff is great. So there’s the mentorship and also kind of a father/daughter thing that happens in the relationship. I have to give the writers credit they really did a great job with that. HJK: With the scripts, they do adapt and they do change. It’s about testing and seeing, looking back on the project and taking a step back and going ‘okay, what do we need more of and what do we need less of? I think that being on set and having the experience of acting together was so important. CS: As far as the non-event films go, Ant-Man and the Wasp follows Black Panther and we’re starting to see more representation with and getting more characters like Ghost and Bill having been Goliath, being fans does that excite you? HJK: It was amazing to really play, push and pull with the relationships that Ghost has with the characters in the movie and explore that. She’s a mysterious character. She’s an enigma and it was great to interact with all the different characters and with the Marvel universe you don’t know what’s going to happen next. LF: For me with the world of Marvel. Marvel really did a great job of being inclusive way back in the 70’s. They started in the 60’s being inclusive in terms of what the landscape of America looked like with their characters. So you know Black Panther was born in ‘69, Power Man was born in 70-something. Women were always up front, women always had their own books in the Marvel Universe. CS: The film leans in on the family aspect where everyone has high stakes but it’s still a great race to get to the quantum realm first. Was that one of the aspects that appealed to you? LF: The thing I liked the most about the movie was how smart it is. Yes, it’s funny but in order to be funny, you gotta be smart and the first Ant-Man was really smart, and funny and fun. What’s been great about what Marvel’s been able to do over the last ten years is all of the movies have that kind of spirit of fun in them. There’s a spirit of fantasy and fun and there’s a little wink to the audience to let the audience know ‘Yeah we’re gonna save the world but let’s not take it all too seriously because after all, this is material that’s based on comic books and comic books should be fun. Everybody is in jeopardy in this. Again it’s what makes it so smart because nobody is just clearly good or bad. There’s a lot of grey in this technicolor world. HJK: With villains its not simple, Marvel knows that. It’s not black and white. I approached the character of ghost as she’s the thread definitely to the characters in the movie. She’s the antagonist but she doesn’t see herself as the baddie. In her mind, through her eyes everyone else is bad and she is good. I think the other actors who have approached the villainous roles know there’s always a reason. It’s been fun to explore that with Ghost. CS: Growing up on comics and being fans of the films, was it crazy to be a part of the set pieces especially in this where a lot of practical things get blown up or shrunk down? HJK: Building the character’s physicality was really important and fun to find. I do my own stunts because its so important to have that character ingrained in how you have to fight. We all have different powers, we all have different styles of fighting. I think it’s really good to take charge and do as much as you physically can. It starts with the costume too, it makes you feel completely different. You transform. LF: I love it. This is part of the stuff that you live to do as an actor. It’s to be involved in sequences that are exciting and physical. CS: So Peyton Reed getting you to sign on was very easy? HJK: I felt so at ease and I really had fun and that was the most important thing the kind of tone that Peyton sets for the set for the set is like a family. LF: Peyton and I are both comic book fans. Peyton made a trip to New York City when he was a teenager and went to Marvel Comics. It was life-changing for him. Because he loved the world he enters into it with a kind of enthusiasm that you can’t manufacture. I feel the same way about these books and this material. Ant-Man and The Wasp is now playing in theaters!